Two alumni from the Communication Design Program, Mr. Smith Siripakorn and Mr. Tanawat Koosuwan, were selected among hundreds of entries to exhibit their work in the Design Showcase at Bangkok Design Week 2018 which took place on January 27- February 4, 2018. Mr. Smith Siripakorn’s project entitled,“Siamiotics: Unpack Cultural Idioms” included a variety of printed materials which enabled the reader to understand the origins of Thai idioms and therefore develop a deeper appreciation of Thai culture. Mr. Tanawat “Plan” Koosuwan’s project, “The Print-ciple: Empower Printed Matters” included magazine ads, posters, and product design to remind and raise awareness of the value of printed media, rather than the current trend toward digital media. Both of them graduated last year. Bangkok Design Week brings together the creative community of Thailand along with internationally recognized designers from various disciplines. 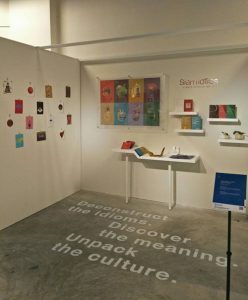 This year’s theme was “The New-ist Vibes” and included showcases, exhibitions, a symposium, talks, a creative market, and a host of other activities at the Thailand Creative Design Center (TCDC), Bangkok Art and Culture Centre (BACC), River City, Warehouse 30, and other venues throughout the city.